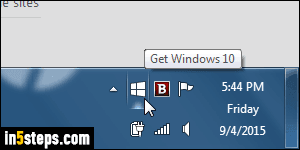 An earlier tutorial showed you how to hide the Windows 10 upgrade icon in the system tray (notification area of the taskbar). Since then, Microsoft has become more aggressive, and starts nearly forcing you to upgrade to Windows 10 your PC running Windows 7 or Windows 8 / 8.1. 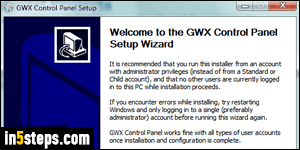 In this tutorial, I'll show you how to install a free, third-party utility that will prevent Microsoft from upgrading your computer without your consent: it's called the "GWX Control Panel". Note: "GWX" is the name of the Microsoft program that runs in the tray, and stands for "Get Windows 10" - "X" is the roman numeral for the number 10. First, go to the GWX Control Panel's official download page. Click on the first link (see screenshot), to start the download. 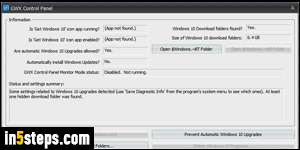 Depending on your browser, run it from its current location, or save and then double-click on it to run the installer. When the installer launches, click Next a couple of times - ideally, keep all the default, and leave the "Run GWX Control Panel" checkbox checked in the last screen, before clicking Finish. Read and accept the user agreement. You'll see a number of buttons that control how your PC will behave when Microsoft tries to upgrade it to Windows 10. Clicking on "Delete Windows 10 Download Folders" will remove any files Microsoft has started downloading (up to 6 gigabytes!) to install the upgrade. Clicking on "Change Windows Update Settings" lets you change how Windows updates your PC: I covered this in "Prevent Windows Update from automatically installing updates". 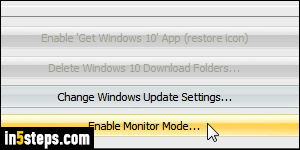 If you click on "Enable Monitor Mode" (I did), this will allow GWX Control Panel to run in the background, and notify you in case Microsoft tries to force a Windows 10 upgrade on you once more. To completely prevent any upgrade, also click on the "Prevent Automatic Windows 10 Upgrades" button! This is a game of cat and mouse, where the developer follows new tactics released by Microsoft, and updates the app accordingly - consider donating to him.